In a Washington where climate change is again a hot debate topic, there is one bulwark of climate science that may be impossible for critics to tear down. The endangerment finding is perhaps the most forceful presence of climate science in President Trump's Washington, one backed by a Supreme Court decision and arguably harder to take on than any other climate issue the administration has fought. Although U.S. EPA under Scott Pruitt has targeted climate regulations at a rapid pace, the endangerment finding — EPA's 2009 determination that greenhouse gases threaten public health and welfare — is a building block upon which they could be reconstructed in a post-Trump era. The EPA boss hasn't publicly committed to targeting the finding, but he's under pressure from conservative think tanks and Trump transition team officials to take it on. In his speeches, Pruitt has focused on the uncertainties inherent in climate science to resist regulations. But that approach won't be enough to roll back the endangerment finding, said Dan Esty, director of the Yale Center for Environmental Law & Policy. "The ongoing uncertainties don't undo the danger that's posed by the buildup of greenhouse gases in the atmosphere," he said. For about 200 pages, the endangerment finding lays out science explaining how the buildup in greenhouse gases is hurting humanity. Without government regulation restricting emissions, the report concludes, humanity is very likely to suffer harm. It points to dire problems like increased heat waves, forest fires and droughts. Those changes and others are the direct result of human activity over the last few centuries, the report says. Warming has risen at an unprecedented rate over several decades. "Most of the observed increase in global average temperatures since the mid-20th century is very likely due to the observed increase in anthropogenic GHG concentrations," the report says. "Climate model simulations suggest natural forcing alone (i.e., changes in solar irradiance) cannot explain the observed warming." Conservatives have pushed the Trump administration to challenge the endangerment finding because it is the building block for the swath of Obama-era EPA climate rules. Recently, Pruitt has signaled that he is open to the idea, though he has not said whether his agency will take it on or punt to Congress. Some see his proposed climate science review, known as a red-team, blue-team approach, as a prelude to challenging the finding. Any attempt to weaken the endangerment finding stands to become one of the biggest battles over the environment in a Washington that's already embroiled in fights over health care, tax reform and investigations into election meddling by Russia. And winning is no sure thing. A legal victory over the endangerment finding would take a mountain of research, observers say. The Obama-era determination is based on more than 100 peer-reviewed scientific studies. It draws on research from the Intergovernmental Panel on Climate Change and the National Academy of Sciences. It has already withstood legal attacks and been upheld by the courts. How would Pruitt do it? It's unclear whether Pruitt will attempt to unravel the finding, but if he does, it would probably be by focusing on the uncertainties inherent in all scientific exercises, observers say. Researchers ready to help Pruitt take on the endangerment finding say they want to pick apart the data used in the science behind the original document. Pruitt has already alluded to that in interviews, saying that carbon dioxide is not the "primary control knob" for the climate and that we can't precisely measure how humanity is warming the planet. He could try to discredit the assumptions around the extent of impacts from warming, as he did with his recent claim that rising temperatures don't pose an "existential threat." Maybe EPA will make the case that CO2 enhances some crop yields. But even if he were to focus on climate science uncertainties, as he often does in interviews, he is still required to protect human health from climate change based on the overwhelming body of data, science and analysis in the administration record, said Esty of Yale. "It would be very hard for Pruitt. 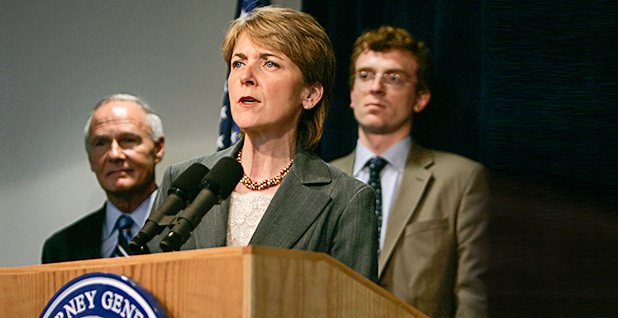 He would almost certainly face immediate and substantial legal challenges, and I cannot imagine that there would be a court that wouldn't overturn a non-endangerment finding given the strength of the underlying climate change science, which points to a range of concerns, albeit with a range of ongoing uncertainties," Esty said. David Doniger, senior attorney for the Natural Resources Defense Council's Climate & Clean Air program, said the endangerment finding is the hardest thing to undo in the climate space. "No one on either side of this debate, except for a few of the wackos on the far-right fringe, no one really expects that these current denial views and rollbacks will last," he said. "If they're not struck down in the courts in this administration, they'll be reversed by the next one." Inside the Trump administration, there's lingering concern that a full-blown attack on the endangerment finding could complicate the president's broader agenda on energy, like rolling back the Clean Power Plan and expanding oil and gas drilling on public lands. Meanwhile, a drawn-out fight in the courts could propel the government toward regulating greenhouse gases if the Trump administration suffers a stinging legal rebuke, according to a senior administration official. But there are risks in not challenging the finding, too. Conservative groups, like the Competitive Enterprise Institute, are pressing the administration to launch a lethal blow against it, because the finding undergirds all future rules to diminish the release of warming gases into the atmosphere. "It's not a politically easy decision to make. To say 'no' to them, that wouldn't be good," the administration official said, referring to conservative groups. "I mean, from a scientific standpoint, maybe that's an easy call. But politically, I would not like that decision. I would not like to have to make that decision. I don't want to get pushed into a corner on that at all." Critics of the finding want it to be the administration's next target, and they're not eyeing the courts as their only route to eliminating it. The proposal by Pruitt to create debate in climate science is a "logical first step" toward taking on the endangerment finding, said Myron Ebell, head of the Competitive Enterprise Institute, who led Trump's EPA transition team. Ebell said much of the science used by EPA to inform the finding could be thrown out because it relies heavily on modeling, which has not been validated. He said the current data available don't justify the stringent requirements of the endangerment finding, and opponents could get a court to agree. 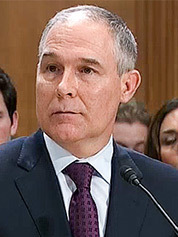 "The endangerment finding is what gives the executive branch not only the authority but the obligation to regulate greenhouse gas emissions, and therefore, regardless of what the Trump administration does to soften those regulations or make them much, much smaller and less damaging, they will still be there, and they will be ready to be expanded as soon as the next administration changes," he said. Ebell also laid out the approach that Pruitt has recently hinted he might deploy to blow up the finding, which is to get Congress to determine it has never given any authority to the executive branch to regulate greenhouse gas emissions. While he acknowledged the challenge of getting a bill passed, Ebell said the administration's attempt to take on the endangerment finding could also come in the form of an appropriations rider. The endangerment finding's supporters shouldn't be so confident about its invulnerability, said John Christy, a climatologist at the University of Alabama, Huntsville, who has broken from the mainstream climate science view that humanity is the driving force behind climate change. Christy said the endangerment finding was crafted by researchers with previously held beliefs and was a "political exercise," not a legitimate scientific finding, because parts were written by people appointed by the Obama administration. Christy, who said he would assist Trump administration officials taking on the finding, accused scientists who worked on it of using biased data. Christy said the primary weakness of the endangerment finding's scientific underpinning is that it does not take into account the failures of climate modeling and relies on faulty data to predict the future. "The science does not support them to the extent that they used it," he said. "When you can prove and demonstrate that climate models used for the basis of the endangerment finding can be falsified, that would at least bring the endangerment finding back for consideration." Scientists who worked on the endangerment finding are optimistic that it can hold up in court. None of the data undergirding the endangerment finding were falsified or biased, and the body of science that informs it has only grown stronger in the last five years, said Gavin Schmidt, director of the NASA Goddard Institute for Space Studies in New York and a federal scientific reviewer of the finding's supporting documents. "The science and the evidence underlying the threat that continued anthropogenic emissions of carbon dioxide and other greenhouse gases make, the evidence for that is growing every day," Schmidt said.